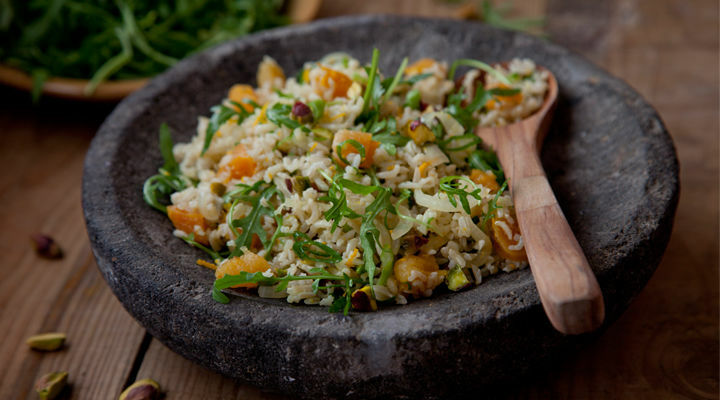 This rice salad is perfect as a light meal on its own or as a side dish for a barbeque. Bring a saucepan of salted water to the boil. Add the rice, reduce the heat and simmer, covered, for 22 minutes, until cooked through. Drain and refresh under cold running water, then leave to drain and cool in a fine mesh sieve. While the rice is cooking, heat a little olive oil in a frying pan set over a medium heat. Add the onion and fry for about 10 minutes, until golden brown. Allow to cool. To toast the pistachios, heat a clean, dry frying pan over a medium heat. Add the nuts and cook for a few minutes, shaking the pan now and then, until nicely toasted. Roughly chop and set aside. Mix the rice with the cooled onion, the chopped pistachios, 3 tablespoons of olive oil and all the other ingredients in a large bowl and season generously. Serve at room temperature.